WWT-600D. Our Line of 6"-8" pipe freeze kits are designed for use with liquid carbon dioxide to freeze stationary water or fluids in pipeline systems. 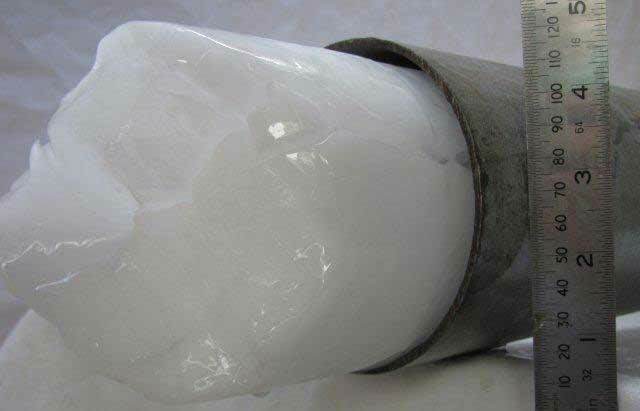 Liquid carbon dioxide or C02 has a very low temperature of -109 deg. 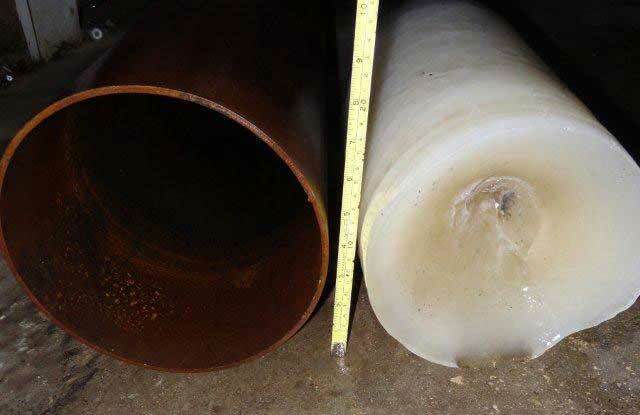 F or -78 deg C. which is used to produce a solid freeze plug inside of the pipeline. 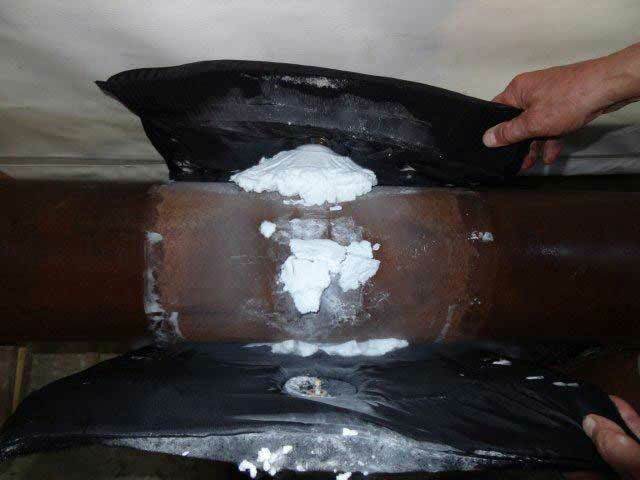 Our freeze kits can be used on Steel, copper, iron or plastic pipes. 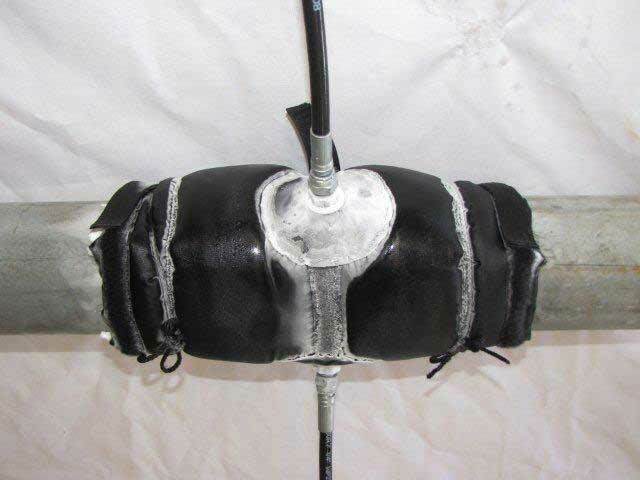 We offer 2 different sized jackets in our 6"-8" pipe freeze kits to keep things simple. 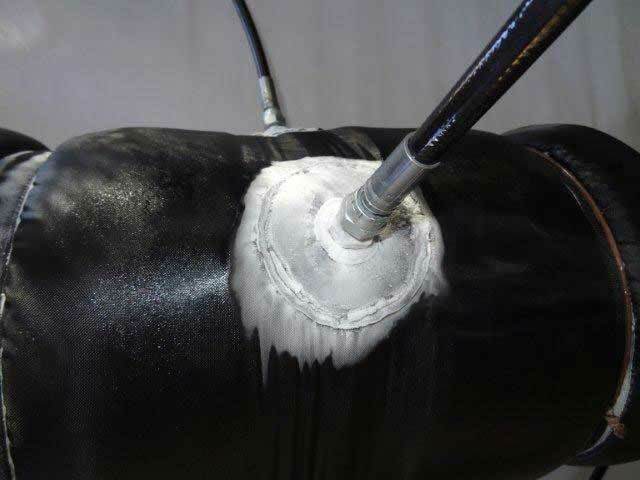 Our small jacket performs 6" pipe freezes, our large jacket performs 8"pipe freezes. We provide detailed instructions and estimated freeze times to help you in estimating how much liquid C02 you will need for your job. In the kit we also provide high pressure hoses, safety glasses, carry bag,and a set of gloves for your protection and safety when handling the frozen jackets. 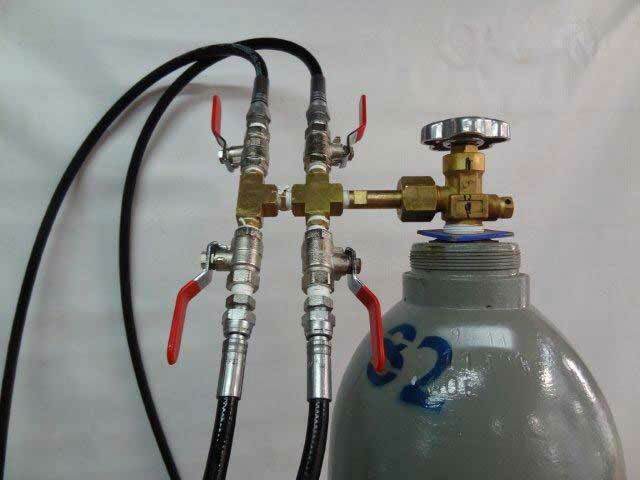 We do not provide the siphon liquid C02 tanks, these can be picked up any welding equipment supply house or gas supply company. 1/2"-4" pipe freeze kit WT400 pipe freeze kit Liquid C02 pipe freeze kit. 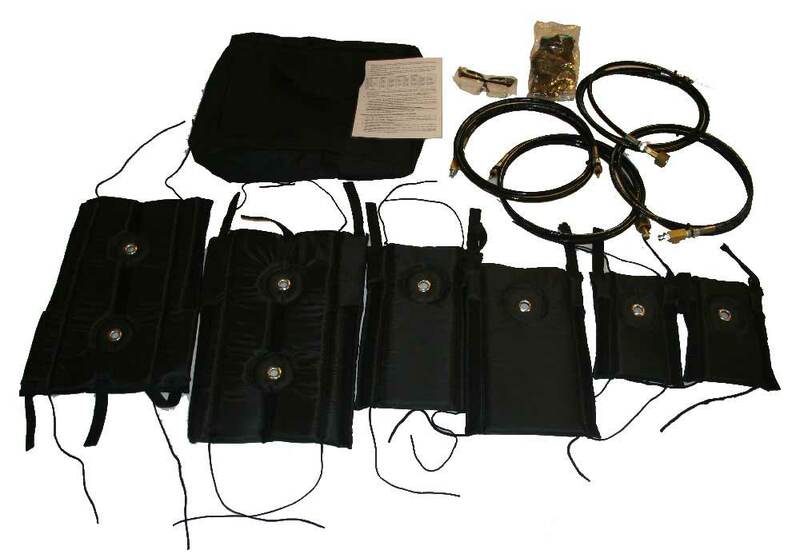 This kit comes with 3 different size jackets to handle 1/2"-4" steel, copper & plastic pipelines. The jackets are designed to be easy to install and comes with high pressure hoses, detailed instructions on freeze times and estimated liquid C02 consumption rates. 1/2"-4" Dual Freeze Kit WT400D dual pipe freeze kit. This kit is same as WT 400 except is is designed to perform dual freezes at the same time. 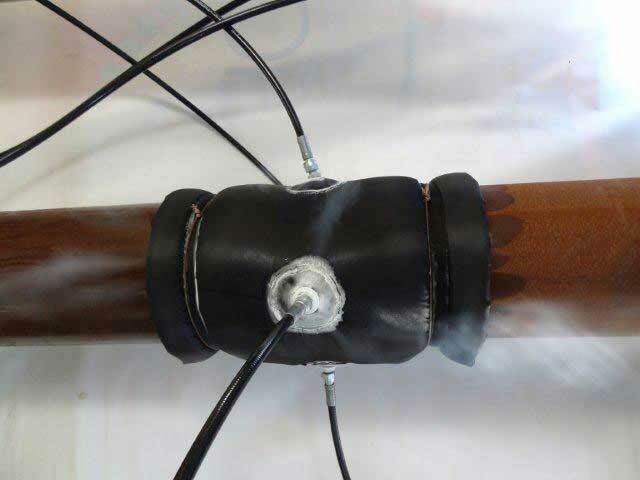 has extra high pressure hoses and fittings, gloves, safety glasses and instruction guide. 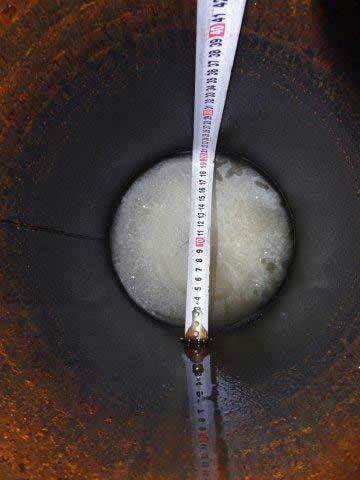 6"-8" WT-600 pipe freeze kit We have designed a liquid C02 kit capable of freezing 6"-8" steel, copper and plastic pipelines. This kit comes with high pressure hoses, freeze jackets, safety glasses, gloves, instruction guide & carry case. Based off our same design as the smaller kits except the freeze jackets have quad injection ports to deliver the needed liquid C02 to freeze the larger pipelines..